One of my favourite childhood food memories has to be the iconic root beer floats from A&W. I remember stirring the creamy and bubbling cold beverage while my feet dangled over diner-style chairs, and willing myself to finish the very large portion so not even a little drop would go to waste. I was so excited when Amy from Foods for the Soul approached me about sharing one of her recipes for Root Beer Float Cookies. 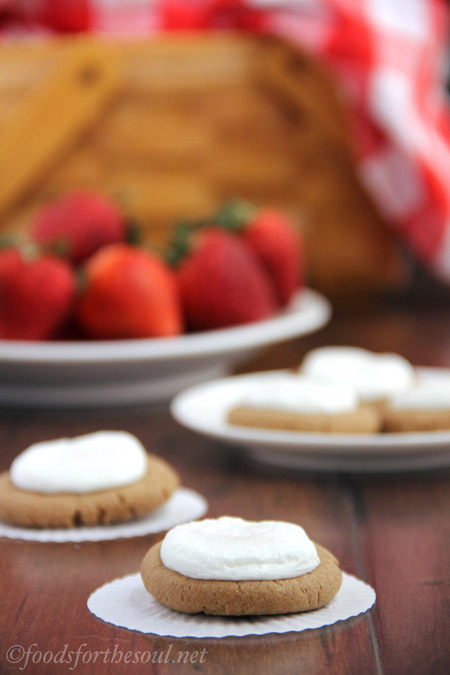 In her words: "These taste just like the drink, but in a not-so-messy cookie form! They’re so addicting that you might want to consider making a double batch." I knew I needed to share them and make them ASAP. So without further ado, I give you Amy and her awesome cookies. Thank you for having me today, Leanne! I’m so happy that you wanted to feature my cookies on your wonderful blog. Occasionally over the summer, I start craving a root beer float, and my guy promises to save me a glass. But by the time I walk the vanilla ice cream back from the store, the scorching heat wave leaves him parched, and he polishes off the root beer without me! Even though I don’t mind adding some strawberries and chocolate syrup to my ice cream instead, I decided to make a dessert we both could enjoy, even if he already drank all of the soda. I came up with root beer float cookies, and they disappeared even faster than his regular 2-liters! Want to check out more of Amy's awesome desserts? Follow her on Twitter, and find her on Facebook, too! 1. Preheat the oven to 350°, and line two baking sheets with parchment paper. 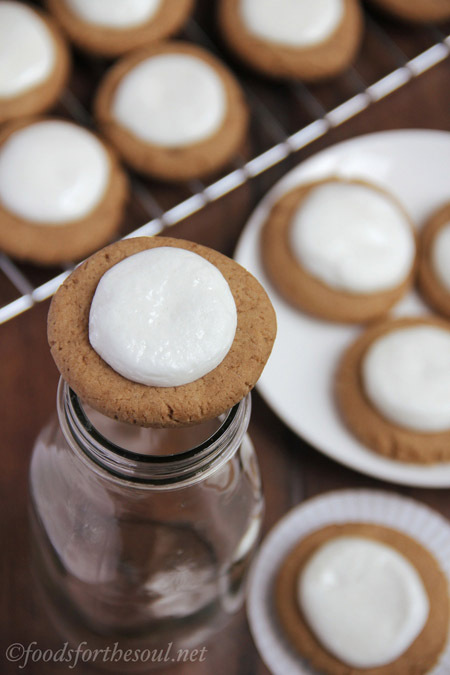 Slice each marshmallow horizontally into thirds, resulting in three circles from each. 2. In a medium bowl, whisk together the flour, baking powder, and salt. In a large bowl, cream the butter and sugar. Add in the egg whites, vanilla, and root beer concentrate, mixing well. Gradually add in the flour mixture, mixing just until incorporated. 3. Divide the cookie dough evenly into 24 pieces, and roll each into a ball. Flatted the ball slightly until approximately 1¾” wide, or just slightly wider than the diameter of a jumbo marshmallow. Place onto the prepared baking sheets. 4. Bake the cookies at 350° for 11 minutes. 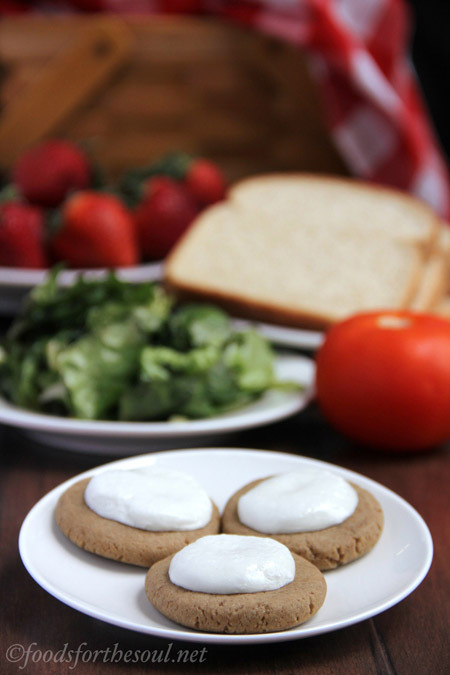 Remove from the oven, and place a marshmallow circle in the center of each. Bake at 350° for another 2 minutes, or until the marshmallows begin to soften and melt. Cool on the pan for 5 minutes before turning out onto a wire rack to cool completely.